Médecins Sans Frontières (MSF) teams are now providing psychological and medical care to people affected by the earthquake in Ecuador which struck on 16 April. More than a week since a 7.8 magnitude struck Ecuador, the repercussions from the earthquake continue to affect the population. Many families are sleeping outside because they’re afraid of aftershocks. Makeshift shelters dot the landscape in the most affected areas with people unsure how long they’ll have to live in these conditions. Official figures put the death toll at 650 people, with 48 people missing and more than 29,000 in shelters. 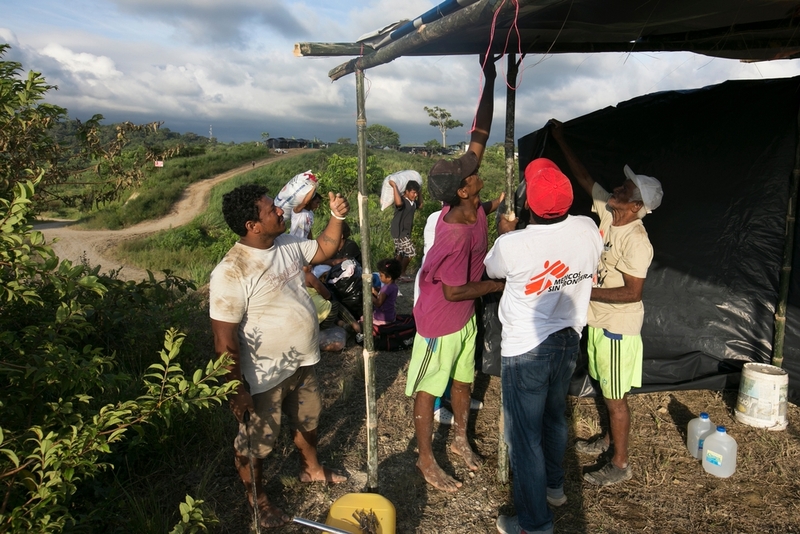 MSF teams in Ecuador are concentrating their efforts in areas where help has not yet arrived. Médecins Sans Frontières (MSF) staff in Tres Vias. Throughout Muisne and Pedernales, MSF has conducted 32 individual counseling sessions, 22 psycho-social activities with more than 360 people, six counselling groups with more than 40 people and 80 medical consultations. MSF has also donated a complete medical kit to treat wounded. MSF staff members Madelen Hernandez and Maria Salazar give basic medical care to people in Pedernales. One of the major challenges has to do with the need to establish coordination mechanisms within the shelters, said Perez. “There aren’t people taking on organisational roles, and this generates unrest within the shelters,” said Perez. MSF teams aim to help by focusing on psycho-social support and community promotion. This week, MSF teams plan to donate hygiene and cooking kits, mattresses, tents, blankets and water to seven shelters in Portete, San Francisco, Guadurnal, Contreras, Sapote and Balistas, in Muisne, and in the “May 31” area of Pedernales. The MSF team also held a training session with medical staff at the hospital in Manta and today trained volunteers in shelters and health centers in Chone. By the weekend, a fourth MSF team will distribute another emergency kit. Challenges continue for people who lost everything after the earthquake; especially people who are living in makeshift shelters. A major rain storm on April 23 left many families living in mud, and they had to find ways to protect their very few belongings. Some used wooden boards to protect their mattresses and food from the mud and others had to move to other makeshift shelters. Ivory Coast: "He's a survivor"